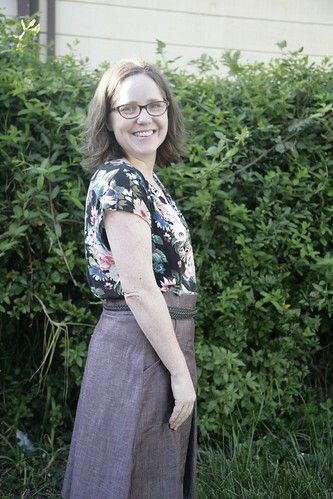 Inder Loves Folk Art: Lisette Skirt: Butterick 6182. Hello readers! Today I have some selfish sewing to share with you. 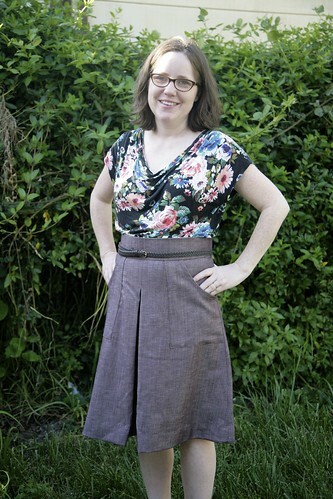 When Liesl announced the release of new Lisette patterns under Butterick, I really liked the looks of Butterick 6182, a boxy top and a-line skirt with a high waist and inverted pleat. I took advantage of the fact that Butterick patterns are steeply discounted at my local JoAnns, and nabbed it on a notions run. This skirt has a fun 1970s safari vibe, am I right? It's just a great, classic, but not boring skirt. I went hunting in my stash and found this maroon stretch "denim" - it looks like denim but feels like it has a good amount of synthetic content. It's nice and heavy and it hangs well. It has a nice sheen, and although the weave looks like denim, the color and shine make it acceptable for non-Friday business casual wear. On the bright side: Stash busting! The pattern labels this pattern as "easy" and I think that's right, although it's not a rank beginner project. It went together pretty quickly and smoothly. The hardest part was (as usual) determining which size to cut. Finished garment measurements are listed on the pattern tissue, which is really helpful when you're unsure how much pattern ease there will be. I ended up cutting a size 12, grading up to a little more than 14 in the waist. In order to facilitate fitting, I cut the waistband in two pieces rather than one. That way I could install the invisible zipper in the back first, and then baste the side seams to check for fit. I was so glad I did it this way! I cut the two waistband pieces with plenty of room to spare, because I was nervous the skirt would be two small, and then basted everything, tried it on, adjusted it, tried it on again, etc. The only other change I made was to remove some of the ease across the back of the skirt (a "flat-derriere adjustment" haha). I'm not 100% content with how the back of this skirt lays, though - this is something I would like to work on if I make this skirt again. But overall I think this turned out really well! Most of finishes were done by hand - I slip-stitched the waistband in place and hand-hemmed it - but not out of snobbery, more because I struggle with stitching in the ditch and machine hemming a-line skirts! My hand-hemming technique could stand some improvement, but it beats trying to hem a steeply a-line skirt by machine (if you've tried this, you understand my pain). I am also planning to try the boxy blouse pattern too, although I'm still pretty skeptical of anything "cropped." But that will require a FBA, so it may be a little while yet. This was my first time trying a Lisette pattern, and it was great! I've already worn my new skirt to work and I was happy with how it held up over the day. I feel like I'm finally starting to figure out this whole "selfish sewing" thing - making clothes that I enjoy wearing and which don't stick out like a sore thumb in my (admittedly quite conservative) workplace. That's a good feeling. 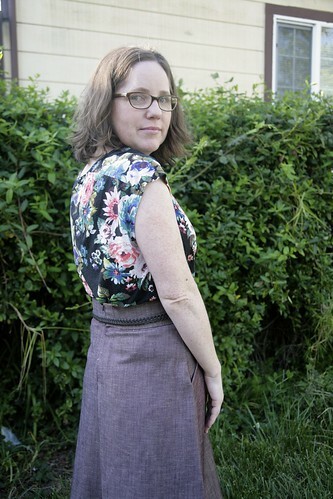 With each item I sew myself, I learn something new and (hopefully) gain a little confidence. It's great! I like your idea re the waistband and adjusting. I have the opposite figure problem of needing a smaller waistband and then an explosion of fabric a few inches down from there! You've also sold me on the idea of a tweed one for winter. That is a really good looking skirt! I've got my eye on this pattern. Would love to try the top too, so I'll keep an eye out to see if you make one. Thank you! I have already cut out the top and it should be a quick sew, so soon! I wish more people were attracted to brownish colours like this... Fiona and I love brown but we are starting to order less and less for the shop because it just doesn't sell, sob! That fabric looks totally like something we would want to order in! LOVE that fabric and it's even better to see it here on the big screen vs my phone! You look so lovely! That last photo is awesome. I have to say, I have come to like cropped shirts, especially with pants (vs skirts). To me it's a little weird with a skirt but I mostly wear knit skirts, so maybe that's why. I loved my O+S cropped shirts. Also, I have had a hard time getting rid of my now empty baby bump this time. In the past, I could not keep weight on nursing and had to eat like a horse to maintain weight. But this time, it's just sticking around. But with some of my other babies, I didn't take care of myself. I drank coffee all day, often on an empty stomach. I almost always skipped breakfast. So I didn't have a very strong appetite. Now I always eat a good breakfast and I don't drink caffeinated coffee (only decaf once and then water). And I rarely drink wine anymore. I think that bothered my stomach too. Anyway, that's the long way to stay my baby bump is still here and the cropped shirt is very flattering because it hides it. So I am a fan! Oh, corduroy or tweed sounds so nice for fall! This looks like a great skirt and how nice to have something work on the first try. I'm also hunting around for good bottom-weight fabric. This one looks like a winner! I love this on you Inder - the style, the fabric - works so well. And I also love your fitting tip - will try it when make this (I loved this pattern from the moment it was released). I have some gorgeous RK linen/denim that I have been hoarding for years which will work really well for this, I think - maybe time to finally cut it! Cute! Looks like a useful skirt. 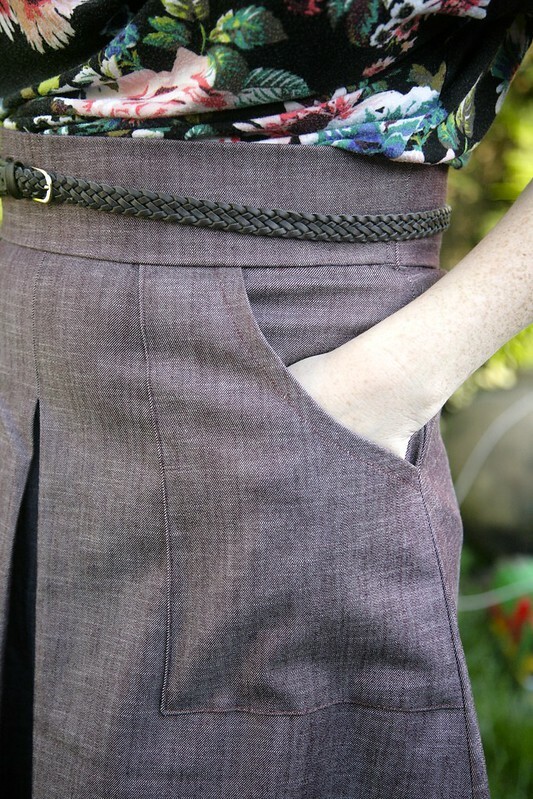 I love the pleat. Beautiful. 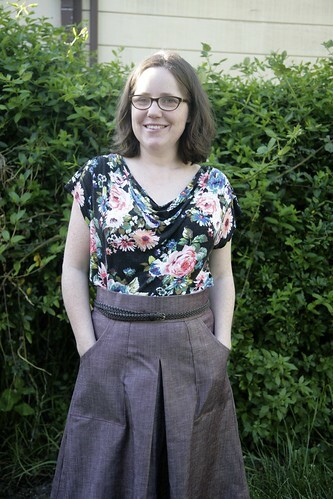 You can make several skirts in one afternoon using the extra pieces of fabric you have lying around your sewing room.